Dolphin’s fast loading times and clean interface made me consider to have a second look at Dolphin. So here’s a way to make Dolphin the default file manager. If you haven’t installed Dolphin yet, install it via apt-get or Adept. More info about that in my previous post. Then, Click on K Menu -> Run Command and type ‘kcontrol’ (without the quotes, of course). 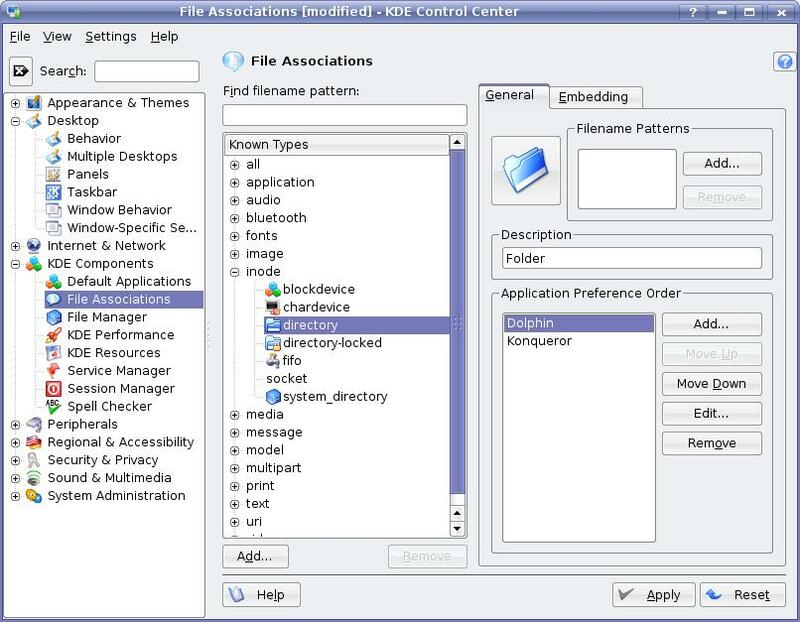 Then Click on KDE Components -> File Associations. Expand the inode section. Make Dolphin the first choice, by moving it above Konqueror in the precedence order. This will ensure that Dolphin gets the first priority for opening directories. Voila! Dolphin is now your default file manager! Previous Post Previous post: Arrgggg Bandwidth Cap, darn you!! Next Post Next post: Go crazy on eye-candy with Compiz Fusion! Thanks. I was wondering where these settings were. I wish they would better-organize the various system control software in KDE so us newbies would see KControl in an obvious place. Why would anyone replace Konqueror with Dolphin as the default file manager? That’s like replacing a Porche with a yugo. Dolphin lacks many of the features Konqueror has. If it doesn’t have a tabbed UI, it isn’t a worthwhile file manager. Dolphin is just a dumbed-down version of Nautilus anyway. if you like software for idiots, you might wanna switch to gnome. except it doesn’t open the system:/ directories even with the %u option applied. Yes, I added it for system_directory. I use ‘dolphin %u’. It opens “/home/sil/” but not system:/home, media, etc. @Sil I’ll look into it and get back at you. Menu > Configure Desktop > Advanced > File Associations > inode> directory. Move Dolphin down > Apply. If you wanna change behaviour of embebbed apps, goto Embedded tab i meke nessessary changes > Apply. In recent versions of KDE 4 (4.3 onwards) it is easier to switch the default file browser by going to System Settings (KControl) -> Personal -> Default applications -> File manager and selecting your favorite there. Den weissen Hintergrund würde ich mit einem dezenten leichten Gelbton anpassen ist angenehmer für die Augen.